They jump on the couch even when you tell them not to, but you love them anyway. They chase squirrels and play fetch. They go crazy playing with tennis balls. 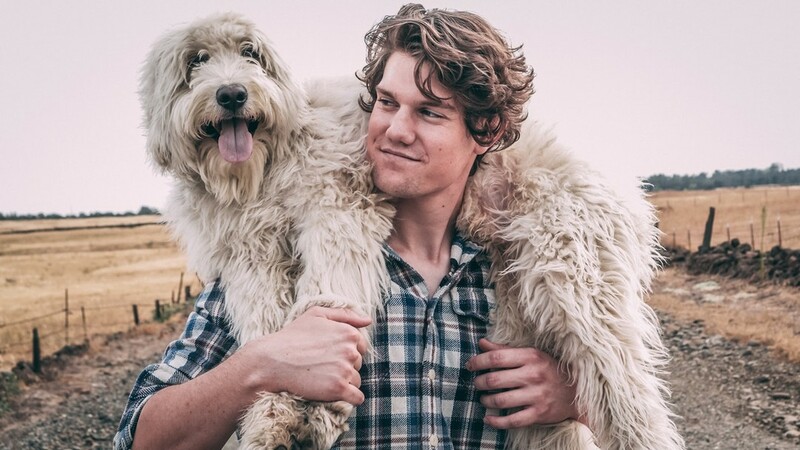 You run and hike with them. Suddenly they start to slow down. Sometimes they limp because of stiff joints and body pain. They'd rather sleep than play. You need to carry them up and down the stairs. Even short walks become a struggle. If only you can keep them healthy and active for as long as they live. What can you do if you don't want the side effects of synthetic medicines but want to alleviate their pain? That's why we have created our Hip & Joint Revita Chews and Nature's Aches Away Bundle that gets your dog feeling like a pup again! Made with only natural ingredients, Hip & Joint Revita Chews improve your dog's joints and cartilage. Nature's Aches Away relieves inflammation, pain and stiffness. Used together, they significantly improves your dog's mobility. And they are soft and delicious so it's easy to give to your old or picky dog. These two premium products are packed with natural ingredients proven to improve mobility, relieve pain, minimize stiffness, and restore joint health. Delicious soft chews can easily be given as a treat or sprinkled over food and made with the highest quality natural ingredients in the USA. This means your dog gets all the nutrition they deserve - and keeps their body and heart healthy, and their joints pain free. TRY OUR HIP & JOINT BUNDLE! You'll be surprised that arthritis is not only caused by aging but by many day-to-day factors. Here are ways to help prevent arthritis and alleviate joint pain naturally and without the risk of synthetic drugs. Obesity is one of the main contributors to arthritis because overweight dogs exert more strain in their joints. Know your dog's ideal weight and maintain it. 2. Ensure your dog is getting exercise. Regular movement helps to maintain flexibility in your dog's joints. However, ease into exercise and don't overdo it. Frequent shorter walks may be better than one long walk. Weight-bearing exercises such as running and walking can be damaging to senior dog joints due to the hard pounding. Instead, try low-impact exercises with your dog, such as swimming to flex joints without adding further stress. Gently massaging your dog's joints can help relieve their pain and make them feel calm. You can also get a professional animal massage therapist in your area to give your dog a massage. A massage can increase your dog's flexibility, increase circulation, and helps with stiffness. Keep your dog warm and dry, as cold damp conditions can aggravate arthritis. Give them a soft supportive bed, such as an orthopedic bed. Alleviate extra strain on their joints by using a ramp or steps to get on or off the bed or into a vehicle, elevate their dog bowls, keep their nails trimmed, and put carpet runners on hard floors so they don't slip and can get their grip easily. There are natural supplements that can help reduce inflammation, relieve joint discomfort and restore hip and joint function. The best joint supplements include glucosamine, chondroitin and omega 3 fish oil. 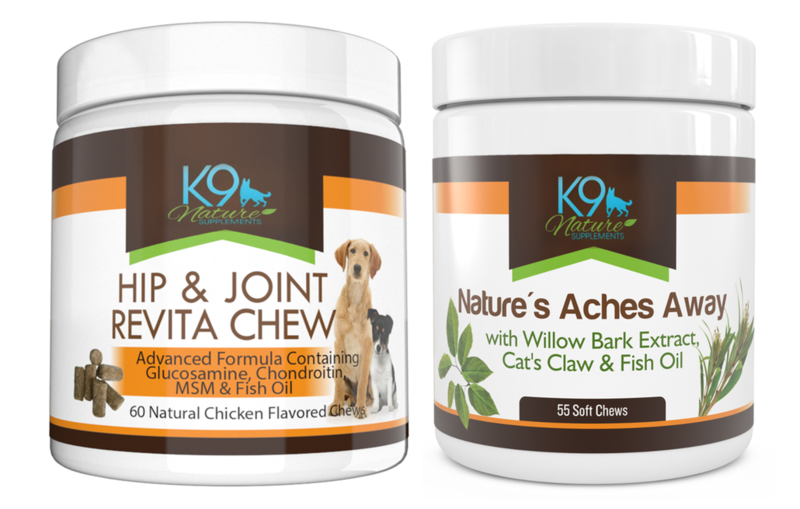 All these nature-derived compounds are found in K9 Nature's Hip & Joint Revita Chews. NSAIDs, such as aspirin, can alleviate pain but usually are not recommended for dogs because of the potential for side effects, such as kidney, liver, or digestive problems. Instead, use natural pain relief herbs such as white willow bark. Our Nature's Aches Away Treats relieve pain with all natural herbal ingredients with fish oil. 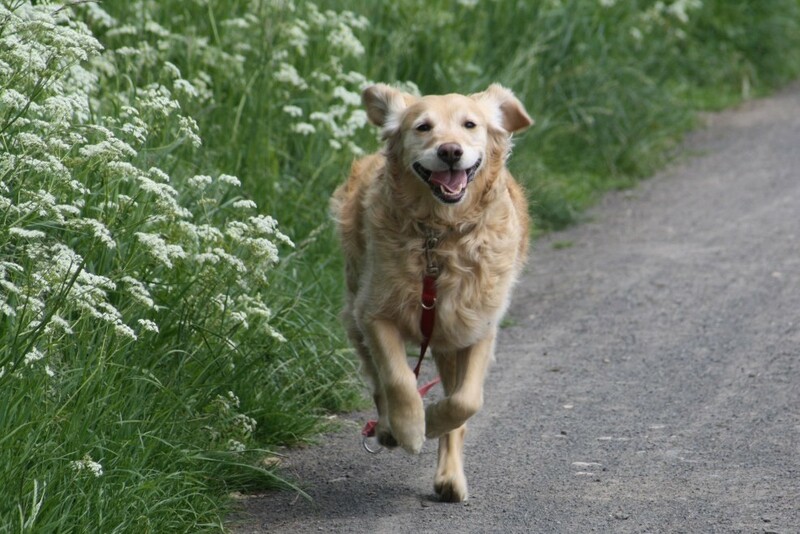 Dog owners are happy that they've found our Hip & Joint Products! "We were sure our 12 year old German Shepherd mix was dying. His health has deteriorated to where he had almost no senses. He stumbled, he spent all his time in bed, he would get lost trying to get around our house, and he appeared to be blind and deaf. Our vet couldn't find anything wrong so she recommended Glucosamine and Vitamin E.
I was skeptical that much would change with a mere supplement, but after a few weeks my dog's health completely turned around. He became like a playful puppy again. We are so thankful we found this stuff from K9 Nature Supplements." "My mini poodle is almost fifteen years old, for a while now her back legs appear stiff, I hate to see her playfulness go especially as we have a sweet little puppy now also who loves to play. Well! What a difference! 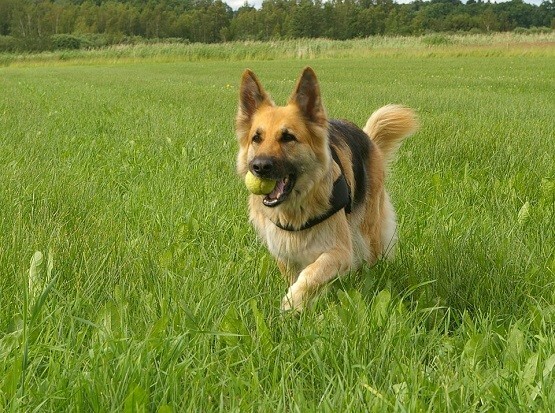 Not only does she love them but is actually romping around again with a noticeable lack of stiffness in her back legs...so good to see her play again!" - Elizabeth I. Keep your dogs happy and healthy. 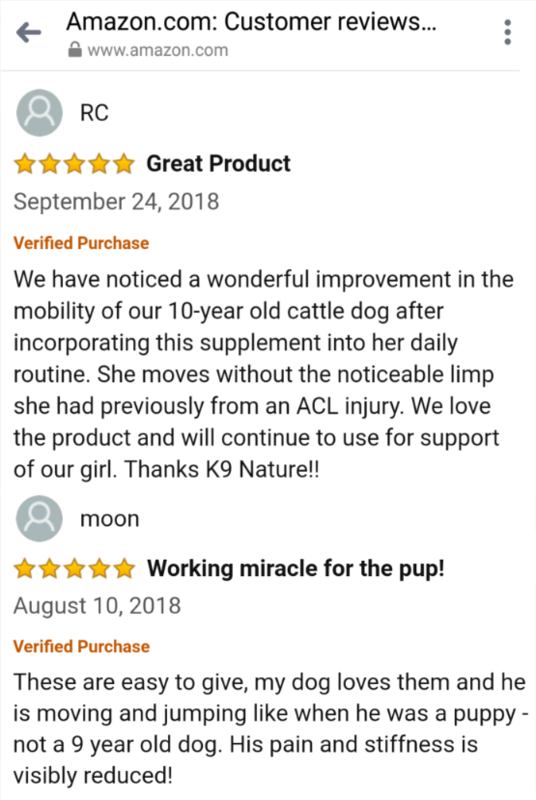 Give them K9 Nature Supplements! Join K9 Nature Supplements' FREE VIP Club! Enjoy exclusive perks, freebies, tutorials and amazing discounts when you join our VIP Club. Joining is FREE. Get 5% discount on your next order when you join the club.